Two blankets and a dog make the trailer toasty warm. Most trailers are enclosed so they’re both warmer than exposed bike seats and great at containing layers–just toss in blankets, large stuffed animals, warm-blooded pets, you name it! 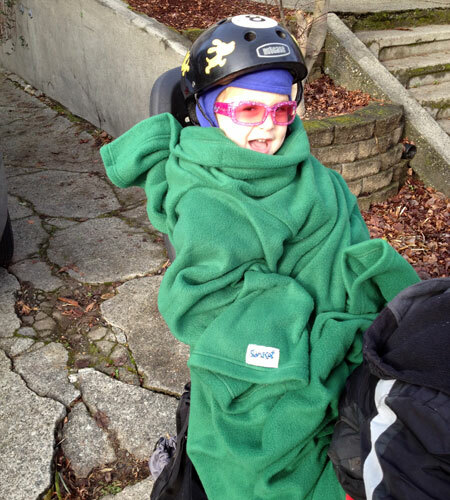 Even when the trailer was no longer part of our main family bike, I loved it — especially on cold days. A bakfiets with canopy keeps passengers comfy. 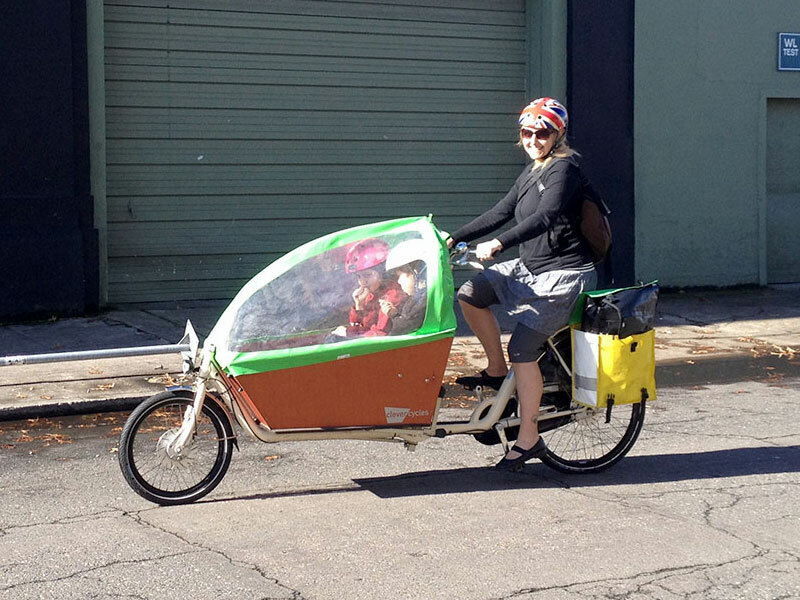 Many cargo bikes and cargo trikes have weather canopies. These are optional and if the manufacturer doesn’t make one, local company BlaqPaks has covers ready for many bike models and they’ll even make custom canopies (check out this 2013 BikePortland profile for more). 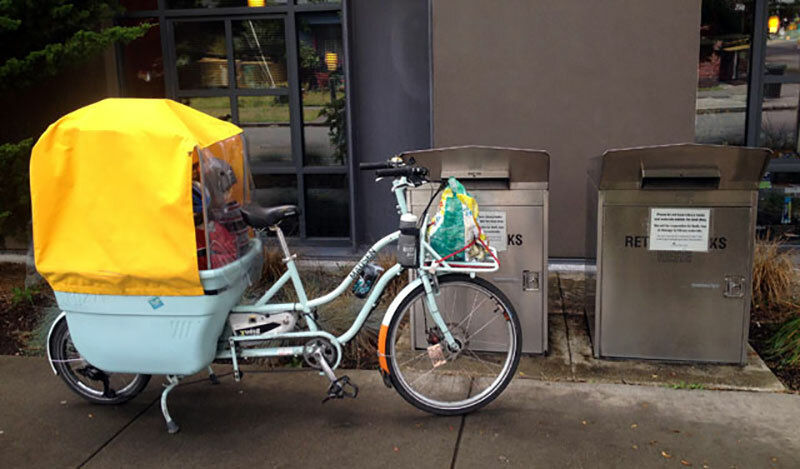 Cargo bike specialty shops like Clever Cycles and Splendid Cycles can also help keep your precious cargo covered. Bobike Mini front kid seat with wind screen. Ordering the windscreen (also called a fairing) for my first kid seat was one of the best things I ever did. It kept each kid comfortable in cold, wind, and rain from ages one to three. Front seats that work with a windscreen include: Bobike Mini, Yepp Mini, and Thule RideAlong Mini. There are also windscreens for the whole bike by Velotop. The classic versions will cover any front kid seat and the family version protects a kid in a rear seat. Handlebar mittens come as sets of two and work fine with shifters and brakes, though my kids like keeping their shifters visible. 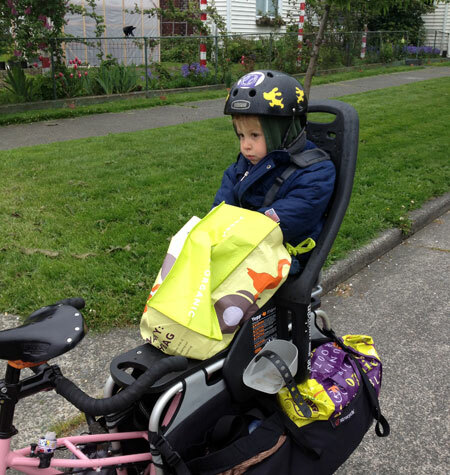 Before I put an Xtracycle Hooptie on my cargo bike, my front kid held onto stoker bars to which I applied handlebar mittens. 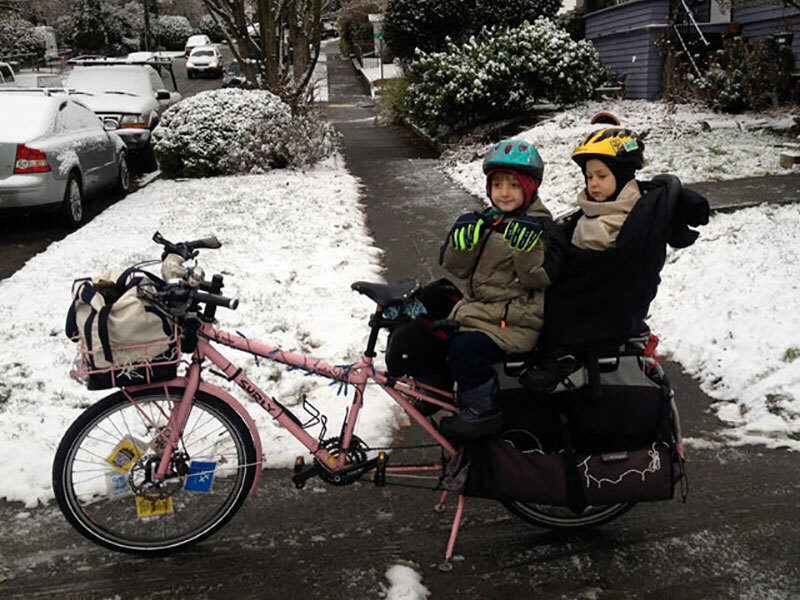 In my photo below, the kids are using black neoprene Bar Mitts and locally-made Portland Pogies (waterproof and fuzzy inside!). These are best paired with thin gloves underneath for any time spent outdoors off the bike. Bar Mitts Baby Jogger Stroller Mitts fit on longtail and midtail roll bars like my Xtracycle Hooptie. Anything metal is going to be cold to the touch and transfer a chill through gloves and mittens. Stoker bars can be wrapped in handlebar tape or covered with grips. 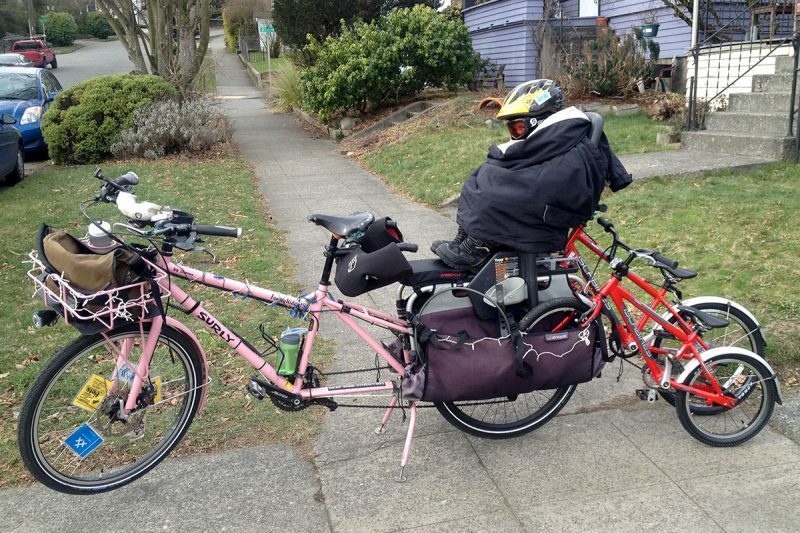 Roll bars (like my older model Xtracycle Hooptie) are good to cover with pipe insulation or handlebar tape. If a kid leg rests against part of the bike frame, consider covering that with pipe insulation, too. 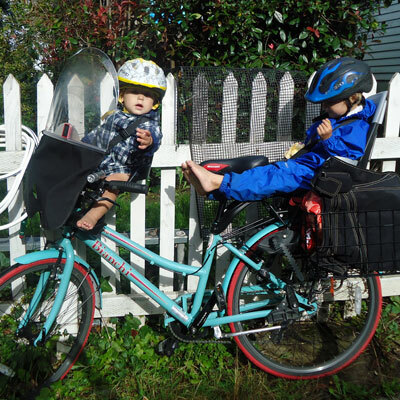 Most toddlers like these DIY bike seat covers. When I got my cargo bike my younger son really missed his front seat windscreen so I made him a new one. Following a couple tutorials, I zip tied half-inch PVC pipe in an arch above his Yepp Maxi seat (which conveniently already has holes in it, otherwise I’d have had to do some drilling). To this I zip tied the sun canopy from a handed down umbrella stroller and then draped my jogging stroller rain cover over it all. He hated it. 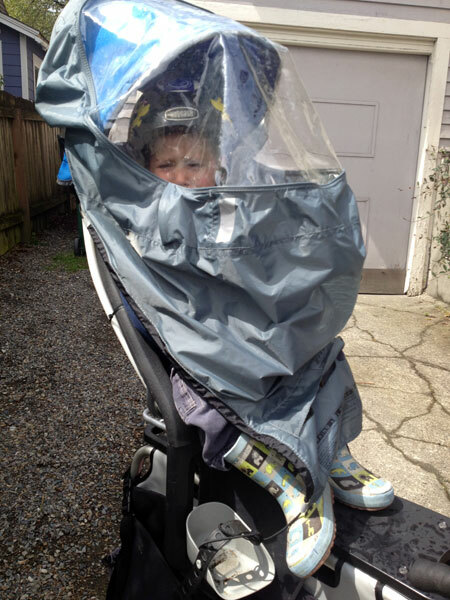 I think he may have liked it better with a clear stroller cover. So we didn’t use it, but I gave it all to a friend whose daughter appreciated it. One of the things I like best about cargo bikes is they provide so much surface area for attaching stuff. Roll bars work well for longtail DIY covers, and someday there will probably be a mass market option or two. 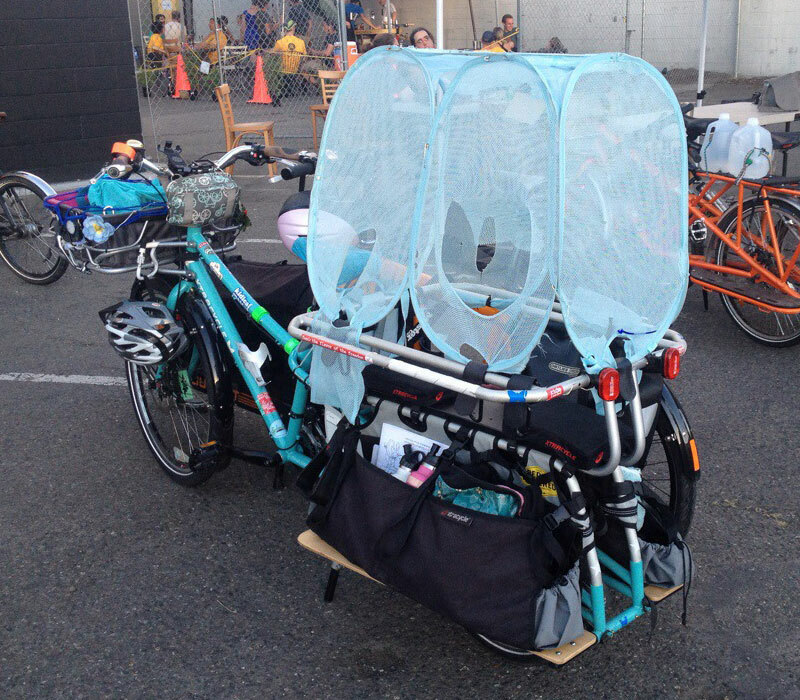 Hamper as canopy prototype on a longtail cargo bike. Before MADSEN made a soft top, some owners made their own. Newt Suit and rain boots all day, every day. I’ve never seen a used one-piece rain suit, but we’ve found all our snow suits, snow pants, snow bibs, and snow jackets in thrift stores. For footwear I like rain boots and snow boots equally, and most of ours we’ve found at thrift stores. Mittens are warmer than gloves, but we use either. Between growing kid hands and disappearing gloves we seem to need a new set each year. This year we found two pairs of gloves and one pair of mittens (I only have two kids, but I like having a spare pair) at the local grocery store after our closest thrift store didn’t pan out. Adult snow jacket makes for a cozy cocoon. 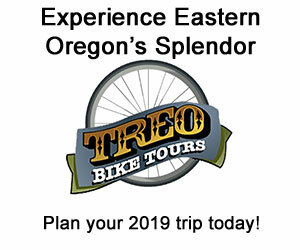 The best part about kids being passengers is being able to make them as bulky as necessary with no worry of pedaling and steering being impaired. I liked using an old snowboard jacket backwards on my rear deck passenger. It was big enough to zip around the back of the seat and pulling the arms through the big hole at the back of the Yepp seat kept the top of it in place. 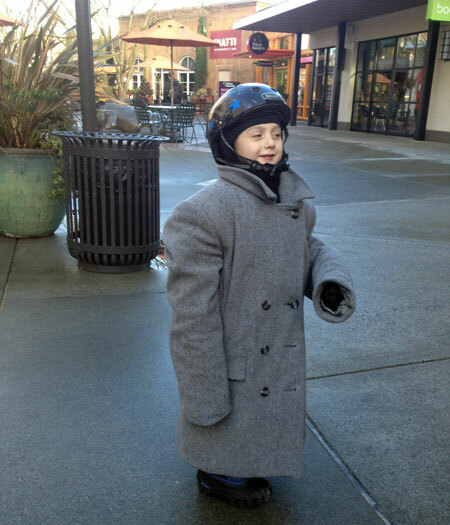 Adult coats also make good extra layers worn forward for kids sitting on benches, decks, and trailer bikes. I’ve often had to give up my coat when we were unprepared for the weather. I also like using an old thin rain jacket as a kid leg apron for extra warmth or in rain, and some even drape down low enough to cover ankles and feet. Gave my wool coat to a cold passenger. Get creative! In a pinch, a reusable shopping bag will keep cold feet a bit warmer if you’re stuck far from home with a miserable passenger. At one point we had a kid-sized Slanket (The Original Blanket with Sleeves) and while I adored the thing the kid didn’t, so I chopped it up to make a couple Halloween costumes and a dog sweater. I still approve of them as good bike layers, though. Blankets are great, but Slankets are great with sleeves! Any layer is warm, but a waterproof layer is particularly good since it’ll block wind and rain, too. I’ve used beach towels in a pinch, but prefer a picnic blanket as a cape–secured with a hair tie or Gear Tie reusable rubber twist tie. 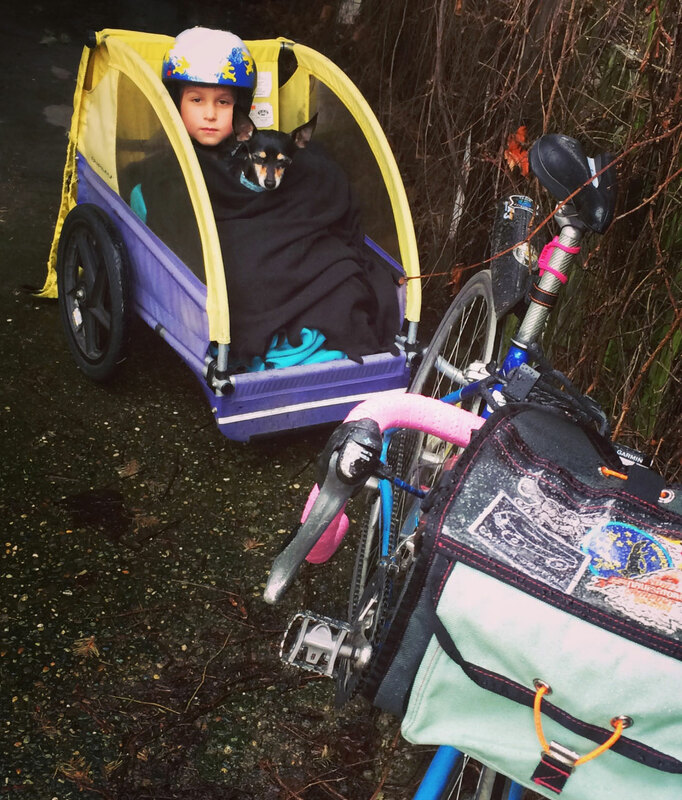 Blankets and buntings designed to work with strollers are also great on bikes. Ski helmets and goggles keep heads warm. We already have snowboarding helmets and goggles so I break those out if it gets really cold. 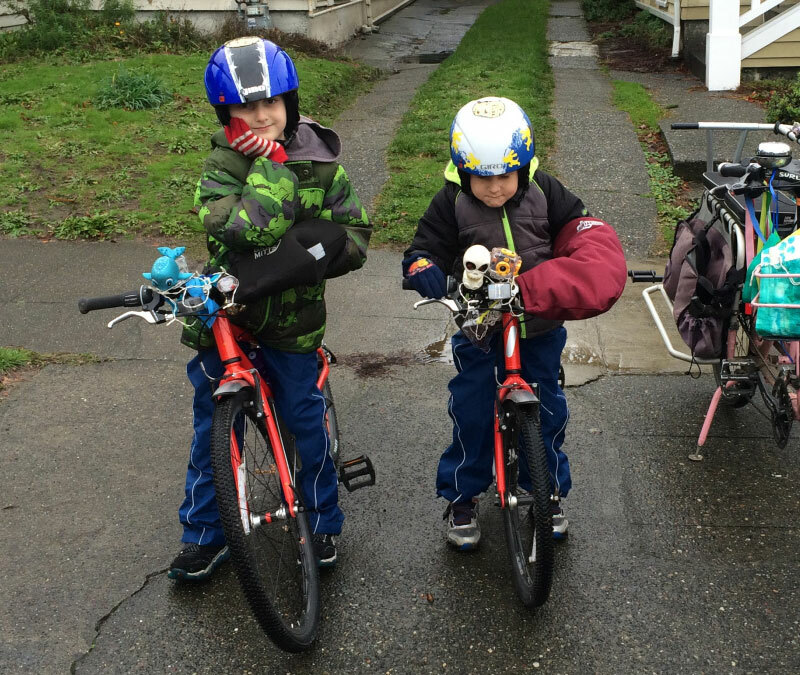 My kids don’t like wearing their balaclavas (even when I call them “ninja masks,” though for many kids that does the trick) so they usually wear knit caps under their bike helmets. Sweatshirt hoods under helmets and/or jacket hoods over helmets can also keep heads and ears warm. I have a set of hand-knit helmet earmuffs I attach to my own helmet straps when it’s coldest, and have considered getting Nutcase Insulation Ear Pads (which will fit any helmet) for the kids if they start complaining of cold ears. Merino wool! We don’t have fancy kid baselayers (just the usual uniform of sweatpants and t-shirts), but I’m a fan of merino wool. 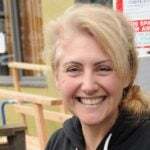 Many friends find their merino wool baselayers on Sierra Trading Post and while I don’t see merino wool in the Sierra Trading Post: kids baselayer search results now, there are non-wool options for cheap. I’ve invested in wool socks for the kids over the years and encourage them to wear them on long days, but they’re usually fine in regular cotton socks. Reusable heat packs when your layers aren’t enough. Not nearly as small as the throw-away chemical heat packs, reusable hand warmers, like my HotSnapZ, are good for thawing frozen fingers. They’re a bit big to stuff into mittens or socks (unlike the non-reusable ones) so we usually use them when stopped for a snack break. Actually two words, the first of which is wind. Anything big on your bike will catch the wind on a breezy day. Weather shields can make all the difference for biking year-round, but might dictate which routes you take on windy days. 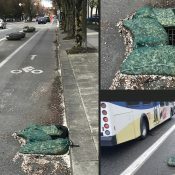 Weather shields are fairly easy to remove and install, but once kids get used to sitting under them, it’s not reasonable to remove them until fall/winter/spring is over. 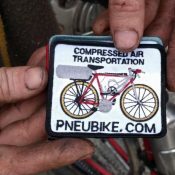 Warning part two: as with anything carried on your bike, be cautious about things that might droop or fall and get tangled up with the moving parts of your bike. Tuck in blankets and securely knot scarfs. You’ve got the kid, you’ve got the layers, but you’re having trouble getting the layers on the kid? I’ve had a lot of luck with silly substitutions, like wool socks in place of mittens (bring the mittens along, and extra socks to double up on sock mittens if necessary). Is your kid part dog like mine? Stressing the importance of keeping a tail warm can make all the difference. Work towards layers, like sunglasses instead of ski goggles for a week. Costume as extra layer: three years ago I had a kid who wore a Blue Angels flight suit as often as possible which made for his warmest two winters ever. Pack along extra layers (or be prepared to shed your own). I’m often shedding my socks to cover cold kid paws, or sacrificing my rain chaps to cold legs. Thanks for reading! Please add your own tips and favorite solutions in the comments below. We’d love to see what works for you! Please send a photo and brief description to me at madidotcom [at] gmail [dot] com so we can share on social media and feature them in future columns. Thank you for this very informative column! My son’s been riding in a Burley most of his 3 years, but I’m now considering returning to being a bike commuter (with him in tow). This article gives me a lot of good suggestions. Check out the all wheel drive fat tire; that’s the tool for the job. Your idea of ski goggles might work well. 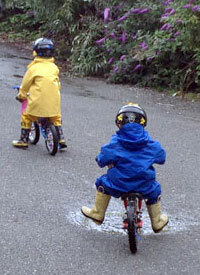 Maybe even better, if there is such a thing for kids, might be helmets with a full bubble to protect all of the face. Maybe kids don’t mind it, but I’d have a hard time enjoying the view through the wavy, rumpled plastic of some of the canopies and covers you have pictured. My younger son would have loved a full face shield and I tried to make one with no success. This Bouclier Visor is $54 but I probably would have invested in it back then, he really missed his windscreen. So glad to have this column. Thank you. Here is an old pioneer trick: bake some potatoes and then wrap them up and place 1 in each jacket pocket…then eat once you arrive! Love it! Reminds me of the emergency potato in The Bike Instructor’s guide to cycling in Amsterdam video, except his wasn’t hot. PS. 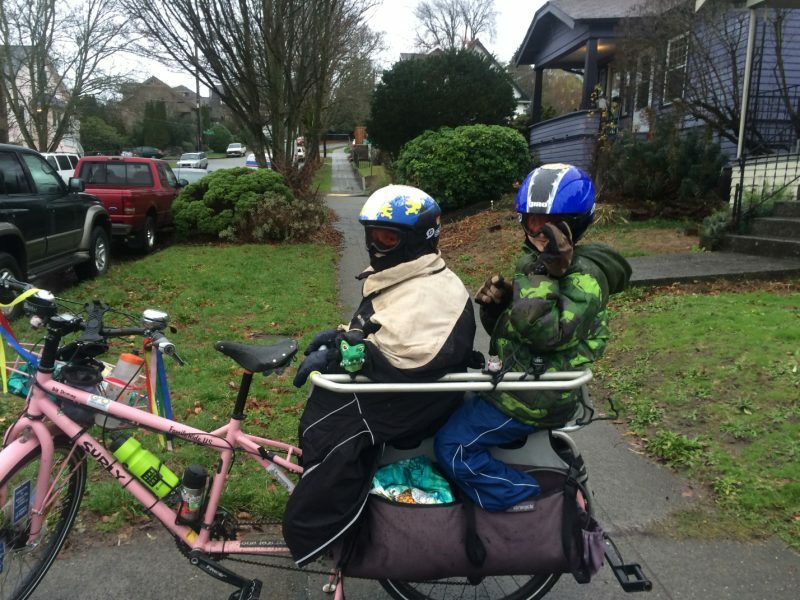 I personally like the bakfiets vehicle style for wet and cold human cargo hauling…easier to keep them warm (and not loose a blanket or binky) and better crash envelope protection if you happen to take a spill on the road. 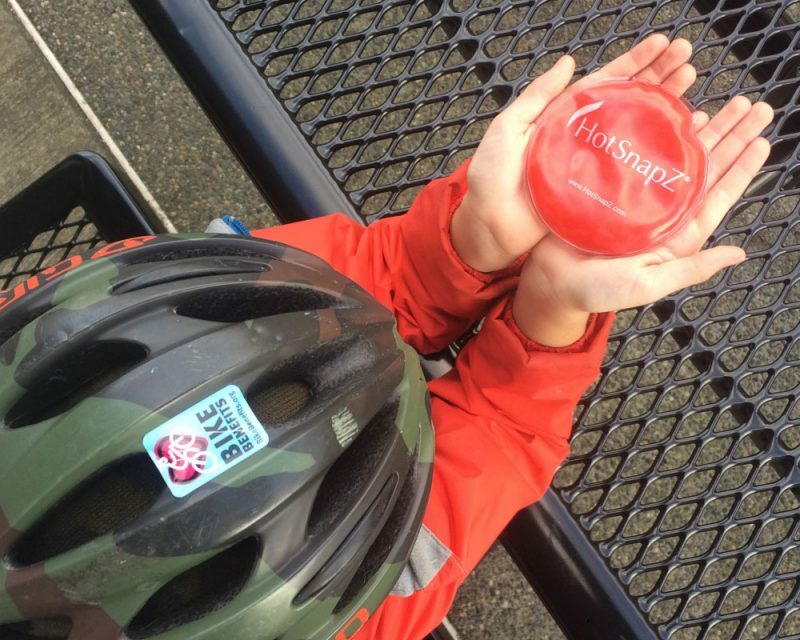 Kudos’s for teaching your kids how to thrive in the outdoors all year round. They will greatly appreciate your efforts as the fossil fuel age comes to an end and most everyone else has to learn these lessons later in life. Thanks for all these suggestions, they are great! A simple warm water bottle has worked wonders for me when temperatures drop below 35 degrees or so. Just make sure the water is not too hot (especially for the very young ones). My best hack for keeping the kids warm on the bike is a dog jacket – sit them in the seat, lay the dog jacket over like blanket, velcro it on, voila. Easy. Cheap. Now that is something I never thought of! Of course, our dog is 9 pounds so her jacket is too small to use. Not to mention her jacket is kind of stinky. 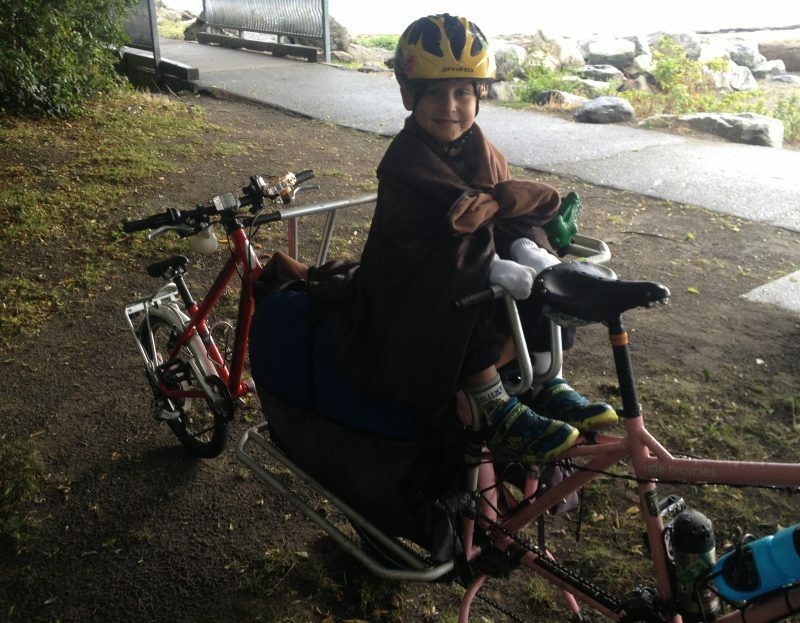 I have a fleece blanket wrapped around the stoker bar on the xtracycle, which is generally enough to keep the wind and a bit of rain off. I tied a bit of webbing to the corners so we have a plastic buckle to click and cinch it snug around the kid and/or yepp seat. I’m sure there are some places in the US you can find something similar. 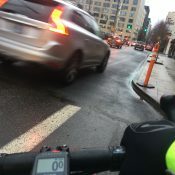 « How are the Burnside Bridge construction zone changes treating you?